There's pasta sauce and there's pasta sauce. There are a million variations and everyone has their own way of making even a basic tomato sauce. But this is the best. Fact. I have no qualms stating that as this is my Mum's recipe and if there ever was an expert in Italian cooking, it's her. Years of making pasta, kneading bread and stirring huge vats of polenta have given her arm muscles that make grown men weep. Cooking meat in the sauce gives an incredible richness and depth of flavour that will be impossible to achieve without. 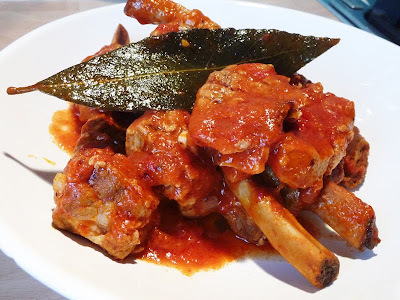 The meat itself becomes incredibly tender, saturated with the rich tomato sauce. The meat falls off the ribs and just showing a fork to the pork loin will collapse it into succulent bite size pieces. 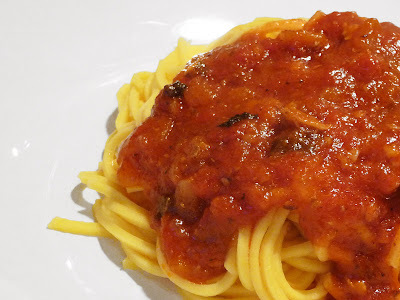 Also, a few clever techniques with the tomatoes gives the sauce a fantastic texture to grip onto the pasta. If you want to be properly Italian about it, only the sauce should be served with the pasta and the meat eaten as a second course with some nice crusty bread and peasant greens. A 2-4-1 recipe if you like! Heat a generous glug of olive oil in a large, heavy bottomed saucepan. Add the chopped onion, garlic and chilli (if it is a big one I cut it into two pieces) and gently fry until the onion becomes translucent. Add the separated ribs and the pork loin slices and brown all over. Put the lid on the pan and cook for 15-20 minutes. Meanwhile, put the plum tomatoes and juice from the tin into a shallow bowl. Cut the top end off the tomatoes then mash them thoroughly with a fork. Set aside. Place the tomato concentrate and chicken bouillon into the empty tomato can, fill to the top with boiling water and stir. Pour this into the pan with the meat. Add a bit more water to cover the meat, add the bay leaves and sage and cook for 10 minutes, bringing it to a rolling boil. Add the chopped tomatoes and continue to cook on a rolling boil until the sauce is thick (around 40 minutes), remembering to stir every now and then.